1. THE PLAYHOUSE MUST GRAB THE ATTENTION OF CHILDREN at various stages of development and CREATE A COMMUNITY OF PLAY FOR CHILDREN OF ALL AGES. 2. Given the fact that children do not always have the cognitive development necessary to express themselves with words, THE PLAYHOUSE MUST ENDEAVOR TO CREATE THIS COMMUNITY THROUGH ACTS OF PLAY. The playhouse must therefore encourage its occupants to discover together, trade notes, and help one another discover new ways to play. 3. To maintain this play, THE PLAYHOUSE MUST CREATE A DIALOGICAL RELATIONSHIP WITH ITS OCCUPANTS. Instead of imposing a specific brand of play, the offered environment must defy convention and instigate the creation of new occupations and uses. 4. Finally, THE PLAYHOUSE SHOULD ALLOW THE CHALLENGES POSED BY THIS DIALOGUE TO PROMPT CURIOSITY, INSTIGATE CREATIVE EXPLORATIONS, AND ENCOURAGE INTELLECTUAL DEVELOPMENT. 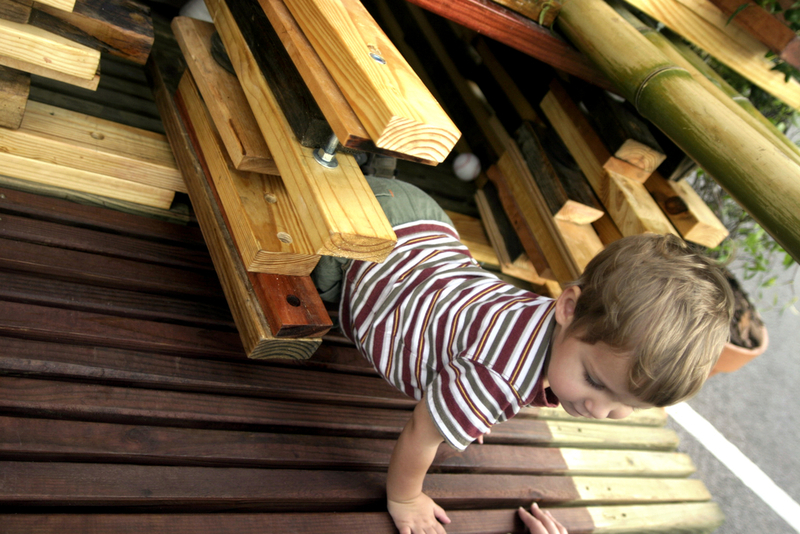 The resulting tectonic approach allowed us to assemble a playhouse in less than five days using primarily found or recycled material. The resulting work not only raised approximately $7,000 for a local charity that helps grieving children, but it has since been donated to a group that works with battered women and abused children. FUNDING SUPPORT: The Agape House and the International Design Clinic. PARTNERSHIPS: The Agape House of Lafayette, the University of Louisiana at Lafayette, and the International Design Clinic.